Worlds collide when the masters of spontaneity are aiming to do business with the center of Nordic Noir. At the very last minute the Brazilian Defense Ministry and the Swedish company Saab agreed to postpone the signing of the contract that will define the financial details for Brazil’s buying Swedish Gripen fighters. The deadline for signing the contract was Monday July 6th 2015, but it is now to be signed in late October instead. The adjourning required President Dilma Rousseff to call her Swedish colleague, Prime Minister Stefan Löfven, and beg for time. However, the compromise comes with a catch. Until late October, the contract and its terms are to be approved by the Brazilian National Congress. 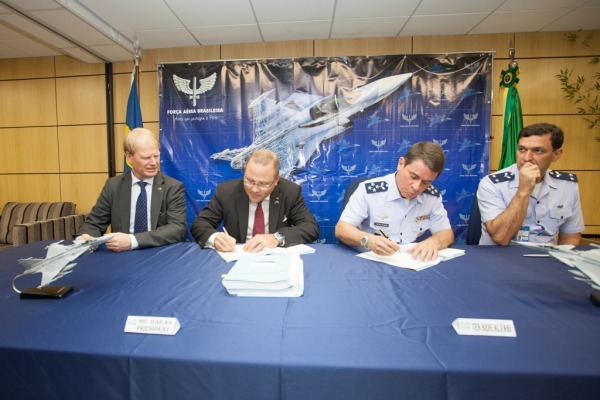 The Brazilian Air Force Commander, Nivaldo Rossato, and Saab executives met with the Brazilian Defense Minister, Jaques Wagner, to come to an agreement. Wagner claimed that there is not possibility of Brazil backing out of purchasing the Gripen fighters. He promised that an effort will be made to determine the financial details. The Brazilian Air Force signed a contract in October last year to buy the Swedish fighters to a cost of US$ 5,4 billion. However, Brazil is determined to renegotiate the interest that was agreed upon in the contract, since the economy in the country is suffering a recession. The Brazilian Minister of Finance, Joaquim Levy, claims that a renegotiation of the interests will save the country over US$ 300 million in 25 years. Furthermore, the Minister wants to use the renegotiated Saab contract as a model to revise other international contracts that have been signed by other Ministries. Since the interests have fallen in Europe, the Brazilians see an opportunity to improve their stakes. In an informal ambient this kind of behavior is called “jeitinho”, a Brazilian way of rearranging a done deal so that the benefits increase. On the opposite side of the globe, the Swedes are great fans of rules and efficiency, tending to arrive at least five minutes early to meetings. Behind the scenes there are claims that the Swedes have argued that a renegotiation of the interest is a violation towards the OECD’s Export Credit Arrangement. A breach of the arrangement could lead to reprisals from the World Trade Organization (WTO). Accordingly, the Swedes insist that the interest was defined the day the contract was signed in 2014. In Brazil’s 2015 budget, R$ 1 billion (approximately US$ 320 million) have been reserved for the buying of the Swedish jets. However, since a long-term plan to pay off the planes is being structured, the Brazilians do not expect to apply all of the money that has been set aside. With an increasingly tense domestic situation ignited by the Petrobras corruption scandal which has generated demands to impeach President Rousseff and inflation hitting 8,89% it is alarming that Brazil chooses to suspend the Saab contract. Not to mention the financial blow after the most expensive FIFA World Cup ever and the Olympics coming up next year, which are also bleeding money and are as late as the preparations for the World Cup. To samba your way around your own country, wasting your proper means is one thing. But when you ask a Gringo for a dance, you cannot expect them to fall for you charms. Certainly not in a world concerned enough as it is with Grexit and the future of Europe. This entry was posted in Blog, Brazil, Defence Industry, Dilma Rousseff, Gripen, Saab, Stefan Löfven on 8th July 2015 by Cecilia Vaccari. Price of the Saab Gripen New Generation questioned. Photo by Saab. 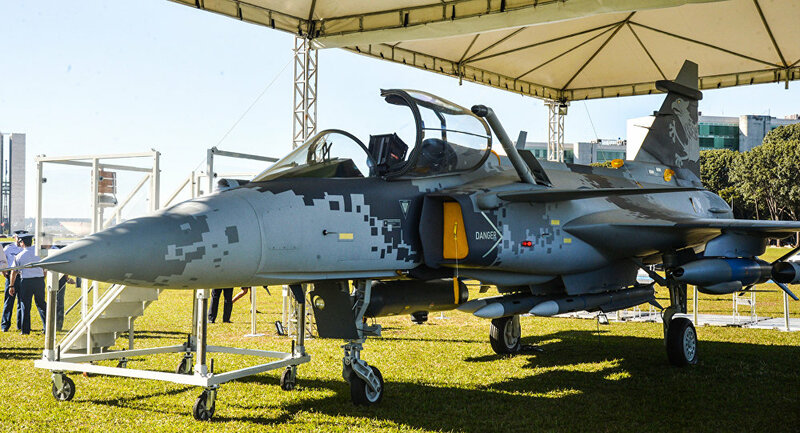 The final contract that was signed by the Brazilian Air Force and the Swedish Defense company Saab was US$ 900 million dollars more expensive than the initial estimate. The Federal Public Ministry of Brazil (MPF) is now examining if there are any irregularities behind the final pricing of the Saab Gripen NG. 36 Saab Gripen NG fighters were ordered by the Brazilian Air Force at a total sum of US$ 5,4 billion and the contract was signed in mid October 2014. Brazilian congressmen questioned that the price had gone up with approximately 20 percent of the original price of US$ 4,5 billions. Since then media have continued inquiring the matter. – We are at the first stage of the investigation process, examining if there are any irregularities involved in the pricing of the fighters. It is not yet a judicial process. We are evaluating if there are any reasons for us to initiate a proper legal process. Since there had been many speculations on the topic an investigator at the ministry decided to initiate the process. A new investigator is to be assigned to the case next week, taking over after general inspector Eliana Pires Rocha. – Basically the price went up because of the requirements of the client. We offered a product and they has additional claims, such as the Wide Area Display (WAD), according to Buskhe. The alterations are the reason that the price was increased US$ 900 millions compared to the original proposal presented in 2009, according to both Saab and the Brazilian Air Force. The competitors for the deal were the American Boeing F-18 and the French Rafale, produced by French Dassault. On March 15th protests have been scheduled in over 200 cities all over Brazil, calling for the impeachment of President Dilma Rouseff. The largest corruption scheme ever in the country, Operação Lava Jato where the state owned oil giant Petrobras is accused of laundering money to politicians at a sum of at least US$ 10 million and the overall weak economy in the country have cause the support for the President to plummet. A Datafolha poll in February shows that 52 percent of the Brazilians believe that Dilma not only knew about the corruption scheme but that she also let it happen. Moreover, 44 percent disapprove of her administration. Thus the protesters are calling for the impeachment of the President. The measure leans on the historic background of the country where President Fernando Collor was impeached in 1992 after involvement in a corruption scandal. The oppositional party PSDB and former presidential candidate Aécio Neves are supporting the protests planned for Sunday. However, Neves claims that he does not support the impeachment of the President. Critics claim that the protest movement is in fact orchestrated by the opposition and the commercial media to overthrow the government. The elections were concluded by the end of last year and the will of 54 million Brazilians then was that the country remained in the power of the Worker’s Party (PT) and President Dilma. This entry was posted in Blog, Brazil, Defence Industry, Democracy, Dilma Rousseff, Gripen, Politics, Saab on 13th March 2015 by Cecilia Vaccari. 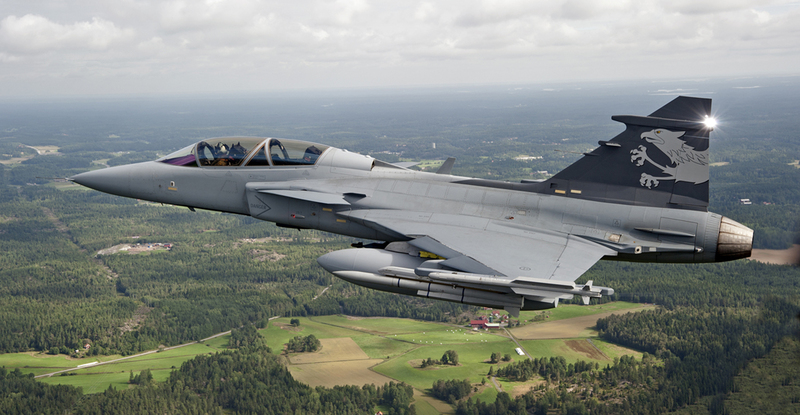 Brazil wants a next-generation air force with the Swedish Gripen. Photo by Saab. A highly positioned source has confirmed that the Brazilian Air Force will buy a total of 108 Gripen fighters from Swedish Saab. According to the aviation magazine Flightglobal the batches will be delivered in three rounds. 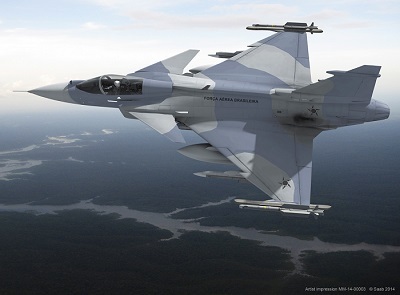 Brazil signed the contract with Saab to buy Gripen just before President Dilma Rousseff was reelected in mid October. Just about a month later the source claims that 36 fighters was only an initial order. The Brazilian Air Force is in need of renewal and everything indicates that it will be partly Swedish. The contract requires that the vast part of the fighters will be produced in Brazil. Therefore an extended deal will accordingly result in more work for the people in the country. It will also lead to more jobs in Sweden as well as a lowered production cost to the country itself which has already decided to buy Gripen for its own Defense. At this point there are several exchange programs between universities and organisations in Brazil and Sweden. This tendency will increase even more if the rumours are right. This entry was posted in Blog, Brazil, Defence Industry, Dilma Rousseff, Gripen, Politics, Saab on 18th November 2014 by Cecilia Vaccari. Gripen test platform NG with new droptanks . Photo by Stefan Kalm/ Saab. Days away from the second round of the Brazilian Presidential elections the government manages to sign an aerospace industrial co-operation agreement with Argentina. This includes the intention of the southern neighbors to buy 24 Saab Gripen NG fighters. That is to say the Gripen that is to be produced to 80 percent on Brazilian soil. This raises the dilemma if increased sharing can lead to boosted vending and occupation. The contract for the Brazilian acquisition of 36 Gripen NG is to be signed by December and one of the main reasons that Brazil chose the Swedish fighter is the almost total transference of technology. In return, the South American giant spoke of great expansion possibilities for Saab on both the Latin American market as well as other allied nations, such as the other BRICS-countries. Accordingly, Argentina might just be the first in line to a large-scale expansion, or perhaps inclusion. The reason that the Defense Ministers had gotten together on Tuesday (October, 21st) in the interior of the state of São Paulo was to celebrate the launch of the cargo plane KC-390. The aircraft was projected by the Brazilian Armed Forces and produced by the national aeronautics company Embraer in cooperation with Argentina, Portugal and the Czech Republic. The Defense Ministers of Argentina and Brazil, Agustín Rossi and Celso Amorim, signing the agreement of expansion of joint projects in the aeronautical sector. “The investments made to produce the KC-390 pieces in the Argentinian factory in Córdoba were fundamental to revitalize the aeronautics industry in our country”, the Argentinian Defense minister Agustín Rossi declared at the event. The expectations in Argentina have sky rocketed with the news. Having an updated aerospace industry and a successful collaboration with Brazil in a moment of deep economic crisis creates hope. Both in media and aerospace industrial forums online Argentinians are discussing how this might be the beginning of a Gripen NG “USAN” (The Union of South American Nations/ Spanish: Unión de Naciones Suramericanas, UNASUR) where not only Brazil and Argentina might be co-producers in developing Saab’s fighter, but maybe even more of the sister nations around the continent. On the other hand, it was quite a large leap for the Swedish Defense and Security company Saab to agree to the technology transfer demanded by Brazil. “Perhaps the technology can be considered “open” with the contract that is to be signed and therefore it might be eligible to spread. However, I do not believe that the transfer will continue over to Argentina. The Swedish and Brazilian Alliance should be sufficient to simply sell the fighters to third-party buyers” according to Oscar Jansson PhD-Candidate at the Department of War Studies, King’s College London, in an interview with Cecilia Vaccari. Undoubtedly, the agreement between the two countries implies in expanded industries, work for the people as well as appropriation and exchange of new technology. As a bonus it might just give President Dilma Rousseff the lift she needs to defeat her rival in the elections on Sunday (October 26th). In light of the bad finances in the country she needs to prove to the Brazilians that she can in fact offer a bright future. Maybe it will even save President Kirchner from her all time low popularity figures before it is time for the Argentinian elections in a year from now. But if both strike out and the plans are dropped, they will without a doubt take the Saab stock with them in the plunge. Do you want me to write you a story on this topic or something else? This entry was posted in Argentina, Blog, Brazil, BRICS, Cristina Fernández de Kirchner, Defence Industry, Dilma Rousseff, Gripen, Luiz Inácio “Lula” da Silva, Néstor Kirchner, Politics, Saab on 22nd October 2014 by Cecilia Vaccari. 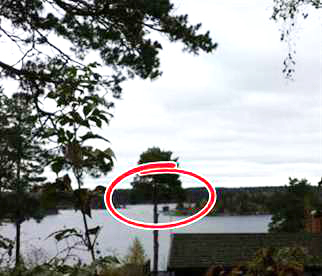 The initial observation of what is believed to be a submarine in Stockholm’s archipelago. There is no matter of telling whether the suspected submarine in the Swedish capital’s archipelago ever existed. But less than a week away from the first alarm there are major changes being plotted both in Swedish politics and economics. The possible effects include an increased Defense budget, updated arguments in the debate regarding Sweden’s joining Nato and a strengthened Saab stock. 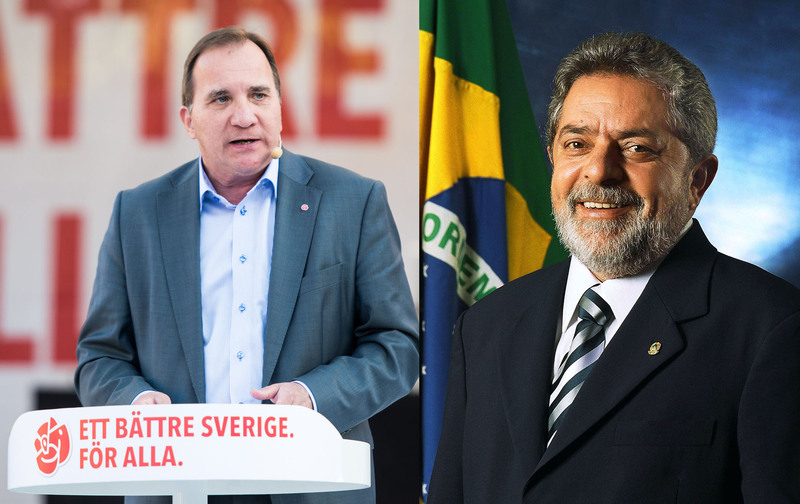 The new Swedish government is lead by the Social Democrats aka “the Workers Party” because of their close ties to the labor unions. They announced during Tuesday, Oct. 21st, that they will most probably increase the Defense budget more than projected in light of the suspected submarine. The economic plan for the coming years is to be presented Thursday, a little more than a month after the election results. It will most probably mean a u-turn from the latest 20 years of cutbacks on the Defense budget. This chain of events is similar to what happened in October of 1982 when the legendary Social Democratic Prime Minister Olof Palme took office. A suspected submarine was spotted in Stockholm’s archipelago. The Cold War panic gripped the Swedes instantly since a Russian submarine had run aground the year before. Consequently, the Marine got a substantial increase in their budget. However, the aftermath of the suspected submarine that was never confirmed in the 80’s include claims from Nato officers that the submarine was in fact one of theirs. Sweden’s joining Nato has long been debated but so far the public opinion is against it. Nonetheless Sweden is represented in more than 150 Nato committees. Now that the fear of a new Cold War has been ignited it is possible that the people change their mind. During Tuesday the Swedish Navy’s Rear Admiral Anders Grenstad criticized that any nation would spy on another one. This is a questionable comment bearing in mind that the Swedish National Defence Radio Establishment (FRA) was a key partner in the NSA global mass surveillance scandal. By the end of Tuesday, October 21st, the best tips the Swedish Army have received in the submarine chase are observations from the public. More than 200 troops on various vehicles have not found a single trace of the suspected submarine that was spotted last Friday, October 17th. But before a whole week has elapsed the consequences of the suspicious object will be a definite heritage in the new government’s budget. Do you want me to write a story for you on this topic or an entirely different one? This entry was posted in Blog, Defence Industry, Politics, Saab on 21st October 2014 by Cecilia Vaccari.